I ran across this conversation-provoking New York Times Book Review opinion piece a few weeks ago, where the author wondered “Does the Size of a Book Suggest Significance?”. It’s a fast read. Go read it. Then, please, come back here and share your thoughts. Do authors and publishers every inflate a book’s size? Most definitely. Big books stand out on the shelf better than thinner tomes and they get picked up by customers more often. A bigger spine seems to communicate a sense of value to a paying customer. It’s a “more bang for your buck” kind of thing. But thankfully, due to new formats and more knowledgeable customers, things are poised for a shift. Without a doubt many of the recently published books I have read could use a good pass by a skilled editor with red pen and machete in hand. It should all boil down to being of value to the reader. But it’s tough. Books have always had a hard time with communicating value. One was to communicate value is by size. An 800-page book is often seen worth the $30 price-tage, whereas today some 288-page books are ring up at $26. One benefit of ebooks happening is the focus on content, value of the work and the words on the page. Not just the girth of the container. While I do not think “efficiency” in the NYT Book Review article is the best way to describe what is needed, I 100% agree with what he is calling for. A good author/editor team will distill, purify and clarify. Big books need to be pruned. So many times authors hide behind “backstory”, “character color” and “world building” to tack on details and increase page count. I agree that they should do away with all the distracting, confusing fluff and just focus on what pushes the characters forward and drives the plot. That is how you serve the reader. Of course, some books will be big and should be big. There is no denying that. But publishers should work hard to build a house that focuses on tight wonderful stories that capture every author’s purest prose and plot while capturing every reader’s mind and heart. What do you think? Do you ever find yourself rolling your eyes while reading big books? Ever wish you could sit down with a book’s editor and talk things out? The digital publishing world is one of the most schizophrenic marketplaces. Now, let me qualify that by saying: I work for a publisher. I help make print and digital books. I know the challenges and the limitations. That being said…. Ugh! Are you serious!? My suped-up laptop can’t do whatever it is this book was designed to do? This stinks. Ebooks have now grown into such a multi-headed enhanced hydra that they can no longer consistently deliver on what is one of the biggest perks of an eBook… instant access on multiple devices. But too be honest all of my frustration (and this blog post) could have been avoided if the publisher had simply stated something along the lines of “best for iOS-only reading” in the product description or marketing copy or email promotion… anywhere. So publishers… please… please… PLEASE… use your own books and see where your frustration lies. Chances are your “ugh!” will be the same one your readers will utter. So think of them and work harder on the book or take the time to be up front with your readers. They will all appreciate you more for it. An ebook at half the price of the hardcover seems like a fair proposition, but I am anxious to see if Rowling fans (or Potter fans?) are willing to pay $20 for an eBook. Maybe it’ll be some all enhanced or gussied up eBook. What I’m really interested in is if there is some agreement circulating to keep the price at $19.99 or if online retailers will be allowed to discount the eBook. I guess no one can tell in these days of DOJ filings and pricing talks. 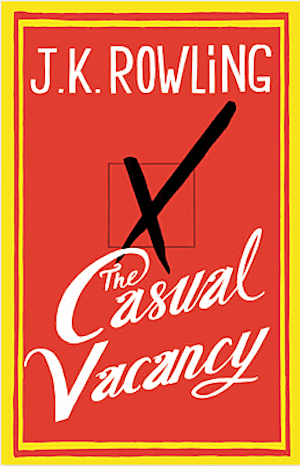 I’m in the global minority in having not read the Potter series and I’m not sure if The Casual Vacancy is something I’ll pick up, but man am I ready for September to see how the book is received and sold.